“Voltron: Legendary Defender” is such a good show. This season continues that quality but brings back some of the issues that I had on past seasons, the greatest being that this one has the widest range of tone from episode to episode and even during certain episodes. This lead to some pretty bad whiplash that at the core kept this season from reaching the level of greatness from last season. These are my non-spoiler thoughts before I get into the details of what went down this season. 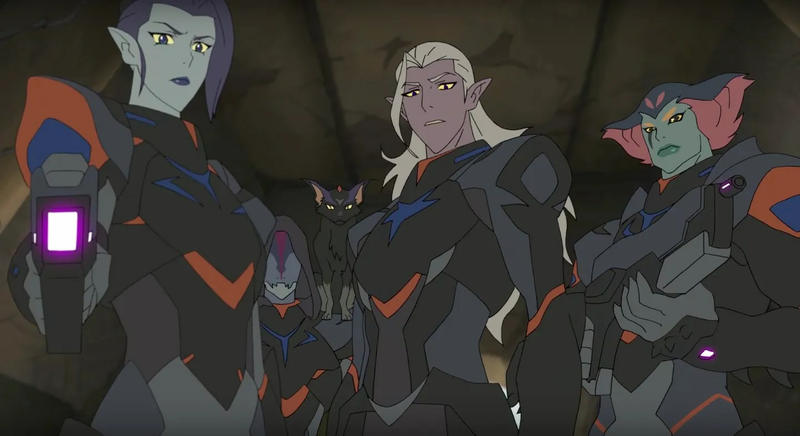 Where we left off is Voltron was trying to figure out Prince Lotar’s plan and to continue the building of Alliances to take on the Galra Empira and Emperor Zarkon had just been resurrected by With Haggar. The Pros: The Blade of Marmora – This season we get to see a lot of these guys, and they are fantastic! They are driven and their leader is the one who gets that they are a blade / weapon so when they die in service of the cause it is what they want, Keith, who is half Galra, does not get this but he devotes himself fully to the Blade which makes when he loses a teammate within the organization all the more difficult. Pidge’s Quest for her Brother – This is a touching episode where she finds his past squad who were annihilated and believes him to be until she realizes his name isn’t on the list. When she finally finds him it is amazing and Matt, her brother becomes an essential part of the Alliance because of his tech. smarts. The quest to find him is also one of the better episodes this season. The Alliance – The Alliance is really cool with leaders from different species who they freed from the Galra fighting with their own ships to free others who live under Galra oppression. They free a giant system from under Galra rule, even though it is almost their undoing from a trap laid by Haggar. The Prince’s Generals – This is the season where the Prince loses his generals as one of them is possessed by Haggar and after he kills her he loses the respect of all the others as they try to turn him so that they are no longer wanted exiles. Seeing how they get there is believable too as the Prince barely communicates with them and never explains his actions, they betrayed him and had every right to. He had lost their trust with the killing of one of them and his failure to explain anything he did. Prince Lotor – The Prince reminds me so much of Zuko in this. We learn that he has no loyalty to his father but we never really know why. He is following his own agenda and is a mystery to those around him, though also extremely smart and dangerous. He escapes the Galra fleet lead by his father as well as his own generals when they betray him and finally saves Keith’s and Voltron’s life when he stops the spell that Haggar is casting. He is one of my favorite characters in this show, hands down. The Last Battle – The Last Battle has some of the best action this season as we see Voltron taking on giant ships in order to liberate the Galra oppressed system. We soon that this is a trap though as Haggar creates a ritual that turns the planet into a giant bomb that traps Voltron on the planet. It is only through Allura’s magic that they are able to escape and only thanks to Prince Lotor that Voltron and the system aren’t destroyed by the bomb. The Cons: Crushing on Allura – Keith does it, Matt…Pidge’s brother does it and it is really annoying. Whenever this happens the guys are given anime eyes and their drawings are done all cartoony. Besides it being creepy that this is a lot of the interactions males have with her who like her it became part of the tonal whiplash. Tonal Whiplash – There is an episode where Lotor is about to exiled from the Galra empire by his father the Emperor…and at the same time Lance is milking a cow and Allura is talking to a cow like it is an intelligent being. It is tonally all over the place and the worst stuff is easily with Team Voltron. I wish it was just one episode but this happens a fair amount before the last episode of the season. This is another good season of a great show that I highly recommend if you like animation and good character driven stories. Dreamworks really created something amazing with this rebooted series and I can’t wait to see where the story goes, though I do hope the last season is coming up soon. I think the tonal whiplash existed because the writers had to burn time as I don’t remember last season having this problem at all as each episode as purposeful and simply advanced the plot. “Voltron” is an amazing show and the level of quality continues in Season 2. Dreamworks and Netflix have really created something rather amazing with this show and with Season 2 they get deeper into the world and characters, though there are some missed opportunities that keep it from being the perfect show. SPOILERS if you haven’t watched the first season. 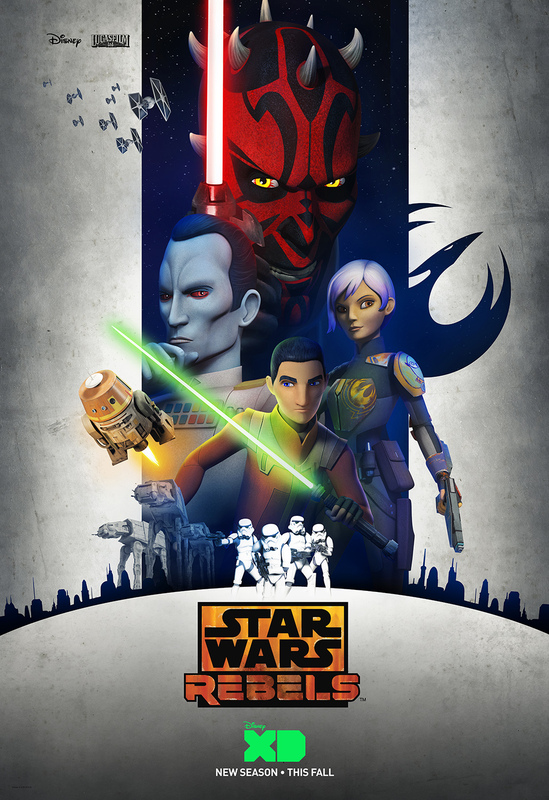 The story picks up with the Paladins seperated leading to them finding each other again while Emperor Zarkin hunts them across the Galaxy as they build a team and seek out allies to fight back. The Pros: The World – The world is amazing! We meet new planets, species and get the history behind the Black Lion. Each episode enriches this world further and it is the world that has me the most excited for future seasons. The Animation – The animation is beautiful. Dreamworks really has a fantastic animation team and I love the anime aspects to how they’ve designed the heroes and villains. The forming of Voltron is great too, I really like how it has it’s own animation sequence of the Lions coming together. The Action – The action is fantastic, especially with the last battle as the Lions and Castle assault Zarkon and his fleet directly. There are great challenges too with some challenging Beasts that Haggar creates. 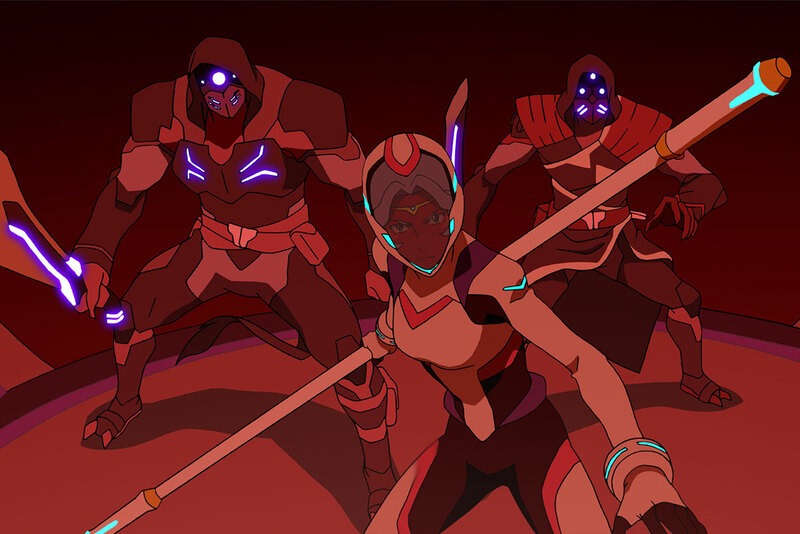 The Blade of Marmora – The Blade of Marmora is a secret Galra organization that is fighting against Emperor Zarkon. They are so cool and really force the Paladins, specifically Keith to earn their help. The Characters – The characters drive the story and most of them continue to grow over the course of this season. It is only a few who really don’t have an arc of any kind. Coran – Coran is annoying sometimes as they overplay his loud personality a few times, but he gets better…especially when we see him in action as a soldier and his intelligence comes into play for helping them. Emperor Zarkon – Zarkon is obsessed this season and it is because of this fact that he becomes vulnerable. If he had listened to Witch Haggar he wouldn’t have ended up on life support. His obsession was his downfall and after how unstoppable he was last season it was great to see his flaws. He also has an awesome Mech that is a giant version of himself. Hunk – Hunk is comedic relief for a lot of it but still manages to grow, such as his mini-arc with Keith where he gets over his prejudice towards the Galra. In this we find out he is a great cook and is the glue of the team. Pidge – Pidge has a predictable arc and discovers her power…she can control vines and roots and finds that nature and tech are connected. She is also the one who helps the Paladins find one another. The arc with the vines I thought was fine but it was her finding the Team and her skills as a tech that really make her invaluable. Shiro – Shiro is the leader and advocate for finding allies among the Galra as it was a Galra who rescued him and tells him about the Blade of Marmora. He is the calm and collected to Allura’s anger and together they are pretty much the parents of the team. His arc is breaking Zarkon’s connection to the Black Lion and learning about the past when the Altean’s and Galra were at peace and Zarkon was friend’s with Allura’s father. It is powerful and I’m really curious how he went missing. Keith – Keith has a fantastic arc as he learns that he is half-Galra and must get over his self-hatred and earn his place among his people in the trials of the Blade with the Blade he inherited. He steps up to be the leader this season as even Shiro knows his time is coming. Princess Allura – Allura continues to be a fantastic character as we get to see her fight in the final fight and risk all of herself to save them from the Galra fleet that is pursuing them. Her arc is getting over her prejudice towards the Galra as the Blade of Marmora show that good Galra exist as well as her feelings for Keith, who she learns is half-Galra. Okay: Lance – Lance is horny and a jokester and contributes nothing beyond being a body part on the Lion. I’m not putting him as a con…yet, as he wasn’t totally awful. The Point of the Final Fight – Shiro goes missing and Zarkon is on life support and the Capital Ship of the Galra seems to be fine. It feels unfinished. Tonal Shifts – Coran is the most guilty of this but some of the creatures the Paladins find are also overly cute and it takes away the threat of the Galra whenever there are too many of them. This was another great season for a great show that you should really go and check out if you like animes or animated shows. This season really showed that the different species are more complicated, which I am always a fan of. Most places go black and white and make simple good and bad like Elves and Orcs of Middle Earth. This show is so much more than that and gives us wonderfully complicated characters who have to grow as they overcome their prejudices. Once more, this show is well worth checking out. 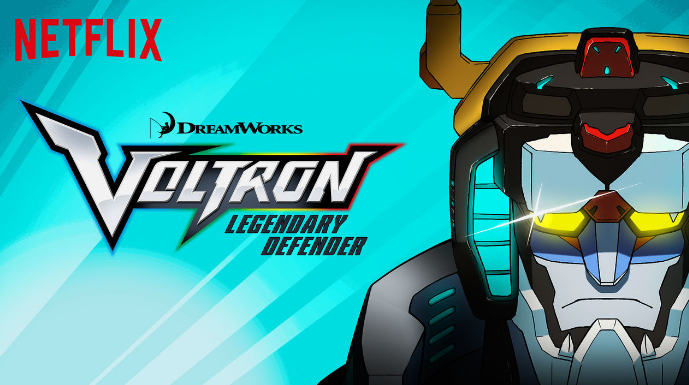 “Voltron: Legendary Defender,” is one of the best animated shows I have seen. It is one of those like “Avatar: The Last Airbender,” that manages to have both innocent humor and a deeper message beyond the simple fantasy that the story entails. There is philosophy worth exploring in this story and it makes me want to see the original (Beast King GoLion and Voltron: Defender of the Universe) that inspired this new take on it. The series is a Korean-American animated show that was produced by Dreamworks with Netflix. The premise involves our main characters discovering the Lions that are made to form Voltron and the Castle where Princess Allura and Coran have in hibernation. Their leader is Shiro who escaped from the Galra Empire as together the five soldiers create Voltron to liberate the Galaxy from the evil Galra Empire. This review contains SPOILERS, so be warned. The Pros: The World – The world it takes place in is wonderful! The Galra Empire has created civilizations of refugees (Coran and Princess Allura) and even those who aren’t refugees are civilizations that are caught in the crossfire or enslaved to their power. This gives a powerful reason for Voltron that the story uses to full degree. The Soundtrack – Brad Breeck created an amazing electronic 80′ style soundtrack that is able to capture tension and the wonder of Voltron magically. I seriously can’t wait to play games to this soundtrack. The Animation – Studio Mir did an amazing job on their animation! It reminds me of old 80’s anime mixed with the much clearer colors and lines of modern anime making it very much something that has no comparison. The Comedy – The comedy is innocent and wonderful…Hunk is used for comedic relief but there is also great stuff done with Coran’s larger than life personality and the rivalry between Keith and Lance. The Civilizations – The civilizations are great! They have unique ways of speaking and looks and history that you really have to see for yourself. They aren’t just aliens of the week, they are people in their own right. The Characters – The characters are the strongest part, they are simple archetypes given depth and made memorable in the process. Commander Sendak – Sendak is one of the greatest commanders of Emperor Zarkon and we see why when he nearly captures the Castle and manages to drive Shiro into a trauma filled rage. What happened to him is still up in the air but I’d like to see him again. His robotic arm is pretty amazing too and I like his bat-like design. Coran – Coran is the comedic relief for a lot of it but we see that he is a good mentor too as he helps the soldiers grow up and we see that what keeps him going is his love for Allura and following her and guiding the main crew. He is a character who in lesser hands would have only remained comedic relief but rose beyond it. Princess Allura – Allura is amazing! She is a healer (she heals an entire planet) a warrior (She rescues Shiro) and a well rounded character who mourns her family and her father but has to let them go in order to save them all. She is probably my favorite character in this series. She is an amazing space elf (look at her design and her place within this universe, her and her people are space elves). Witch Haggar – Haggar is a better vilain than Zarkon…her creatures cause the most damage on planets and she is the one who destroys Allura’s wormhole that leads to the crew getting separated at the end of the season. Emperor Zarkon – Zarkon was once the Black Paladin (Shiro’s role) which makes sense why he wants to claim Voltron. This fact alone gives him so much depth, he is Sargeras, Morgoth and every other fallen Paladin in fiction and he’s been winning for a while. At this point our heroes have only liberated 2 world and injured his capital. He’s fine and a great threat for future seasons. Pidge – Pidge lost her father in the war against the Galra (he was captured) and her story is a girl going undercover to become a soldier to find and rescue her dad. She is amazing and it the tech and hacker whose arc is realizing that others have lost their dad’s too and dedicating herself fully to the Paladin Cause. Hunk – Hunk is the comedic relief who is a coward until he discovers why they fight when helps liberate a world, from here we seee him become a leader and find his confidence. He is still the Bolan/Sokka of the group but he grows up. Lance – Lance is the guy who thinks he is everything and his arc is being knocked down pegs and finding humility. He was explored the least this season, so I’m curious where his arc goes. What arc he does have is getting over his hatred of Keith. Keith – Keith is amazing! He takes on Emperor Zarkon on his own which gives Shiro time to free Allura and get back into his lion. His arc is getting over his rivalry with Keith and learning when to fight as he is the angriest of the group and always ready to fight. Shiro – Shiro is the leader whose arc is facing his trauma and helping the rest come to believe in the cause. He is the oldest and has a mech arm from experiments that were done by the Druids. He is pretty amazing and his arc is still going to be taking control of the Galra tech as it has been used against him a few times now. Voltron – Five multi-colored Lions that care about the Paladins in them and become a giant mecha-Knight. This creature is amazing and I can see why they give time to have the sequence where it is created, cause it is really cool. Facing Trauma – Another theme is the facing of trauma, whether it is Allura facing the death of her father and people and letting go, Shiro healing from his torture and the crew facing the fact that they are soldiers unprepared for the war. This theme of trauma is faced on a individual and civilizational level. Justice – The theme of justice is one that pervades the film. Pidge decides to stay rather than look for her dad, Hunk discovers courage and Allura faces the loss of her family…in all cases the need for justice against the Galra Empire helps our characters to grow. Okay: The Ending – The ending leaves things open for future seasons, which at this point I don’t like as much due to “Firefly.” Unless you know that you are going to get another season don’t have a cliffhanger ending. Assuming that nothing bad will happen and we get a Season 2, I liked the fact that the Lions and crew are now all separated throughout the galaxy. This is a show I’d highly recommend. Netflix has been putting out gold and chances are you will see me reviewing many of Netflix shows. This was a show that had solid base and managed to give depth to a simple premise and characters and in the process create a memorable story that I can’t wait to see unfold. Whether you like animated shows or animes or don’t…this is a show that is worth checking out.